DHAKA, Bangladesh -- plans to relocate thousands of Rohingya who have spent years in refugee camps near the Myanmar border to a southern island, as the region faces a human trafficking crisis. The government has started preparing for the relocation to Hatiya island in the Bay of Bengal in a move backed by prime mnister Sheikh Hasina, said additional secretary Amit Kumar Baul on Wednesday. “The relocation of the Rohingya camps will definitely take place. So far informal steps have been taken according to the PM’s directives,” said Mr Baul, head of the government’s Myanmar Refugee Cell. A Rohingya leader urged the government to cancel the plans, saying it would only make life worse for the refugees – many of whom have been languishing in the camps for years since they left Myanmar. 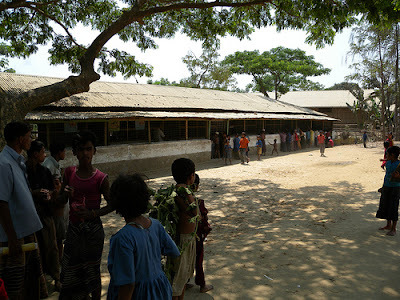 “We want the [Bangladesh] government and international organisations to resolve our issue from here,” Mohammad Islam, a community leader in one of the camps, said. Bangladesh is home to 32,000 registered Rohingya refugees who are sheltering in two camps in the southeastern district of Cox’s Bazar which borders Myanmar. The Rohingya leave Myanmar largely to escape discriminatory treatment by the Buddhist majority. Mr Baul said the move was partly prompted by concerns the camps were holding back tourism in Cox’s Bazar, home to the world’s longest unbroken beach and where locals flock to beach hotels and resorts. “The government has been paying [increasing] importance to the tourism sector. Therefore, a plan to relocate them to an isolated area is under process,” he said. Thousands of persecuted Rohingya from Myanmar as well as Bangladeshi migrants have been attempting perilous journeys by boat to South-East Asia. Thailand began a crackdown on human trafficking and smuggling following the discovery of mass graves there, which appears to have thrown regional trafficking routes into chaos. News of the plan comes just days after Mr Hasina slammed Bangladesh’s own economic migrants, many of whom are stranded in dire conditions at sea, calling them “mentally sick” and accusing them of hurting his country’s image. Badre Firdaus, government administrator of Hatiya island, said 200 hectares of land has been identified as suitable for the relocation. The move would not include the estimated 200,000 unregistered Rohingya refugees who have fled across the border over the past decade and taken refuge in Muslim-majority Bangladesh. Most live close to the two camps but are not entitled to food or other aid. Rights groups say those illegal Rohingya migrants survive in appalling conditions in Bangladesh, living on the margins and running the gauntlet of the country’s authorities.